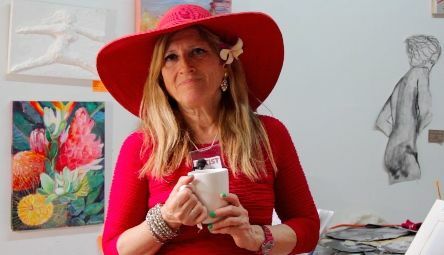 Italian born Lucia Gonnella is an amazing San Francisco artist who adores North Beach. Her brilliant paintings make you want to spend endless hours at an outdoor cafe savoring the sights of this historic neighborhood. I met her on San Francisco’s oldest block – Grant Street – where she was painting the outside of a French-Italian bakery. She called it her ‘mysterious corner’ and spent a month returning to embrace the late afternoon sun just as it cast the perfect light. She says she met so many people during that time, that part of the reason she stretched out her project was to converse with the locals. As she is quoted as saying, “Art is life. Art is movement, Art is a diary of life. Only through art I feel deep delicate sensations”. Lucia looks for spots that have the perfect combination of form and color. I caught up with her at Open Studios in April where she discussed her passion for her work.